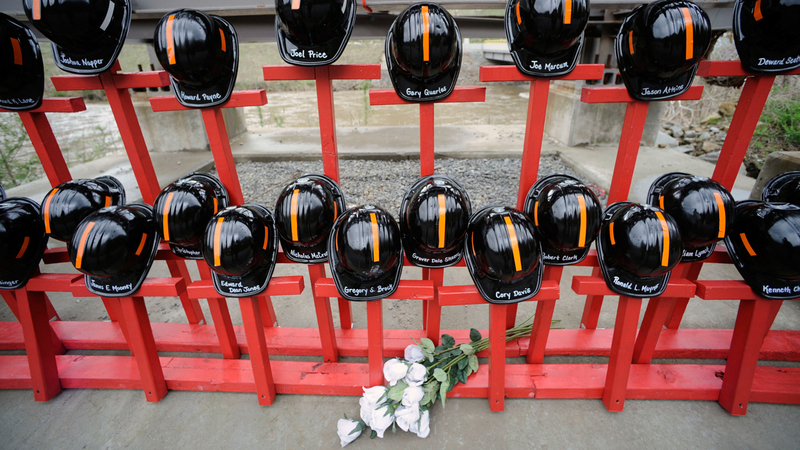 A year ago April, America suffered its worst mining disaster in 40 years with the explosion at Massey Energy’s Upper Big Branch mine in West Virginia on April 5, 2010 that resulted in the death of 29 coal miners. 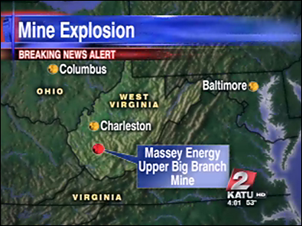 Image: Breaking news alert about mine explosion on April 5, 2010. Source: KATU TV. 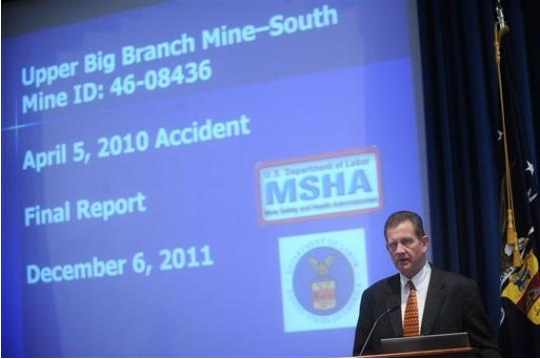 This past Tuesday, December 6, 2011, the Mine Safety and Health Administration (MSHA) issued its final report on the causes of this tragedy. Entitled “Report of Investigation: Fatal Underground Mine Explosion April 5, 2010”, the report reiterated earlier conclusions that blamed Massey Energy management for what MSHA investigators called total “systematic, intentional, and aggressive efforts to avoid compliance” with mine safety law. The report found that the accident was entirely preventable, but that deliberate actions by the company and inexplicable oversights and decisions by the Federal inspectors led to the tragic consequences. Some of the more egregious issues cited in the report include: falsifying records and keeping two sets of books; failure to perform examinations; failure to identify, record or correct obvious hazards; inadequate training; a culture of intimidation of the miners; allowing methane to accumulate without proper ventilation in place; and Federal investigators giving the company advanced notice of upcoming inspections. Additional investigations are under way about MSHA’s role in this disaster as well. 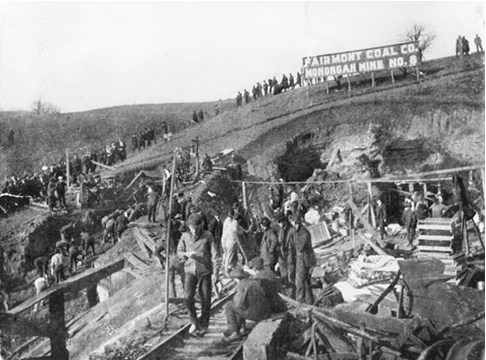 The December 6 date for the announcement of the Upper Big Branch report is significant since it marks the 104th anniversary of Monongah, the worst mining disaster in U.S. history in which 361 men and boys in West Virginia lost their lives, leaving over 250 widows and 1000 children without support. Does the punishment fit the crime? Were these violations even considered crimes? The publishing of the final Upper Big Branch report this past Tuesday coincided with the announcement by U.S. Attorney Booth Goodwin, that the Federal Government had reached one of the largest mine disaster settlements ever—a $209 million civil and criminal settlement—with the company that bought Massey Energy earlier this year, Alpha Natural Resources. The settlement protects Alpha executives from prosecution, but not Massey management, 18 of which to date have refused to be interviewed by federal investigators, invoking their Fifth Amendment rights. 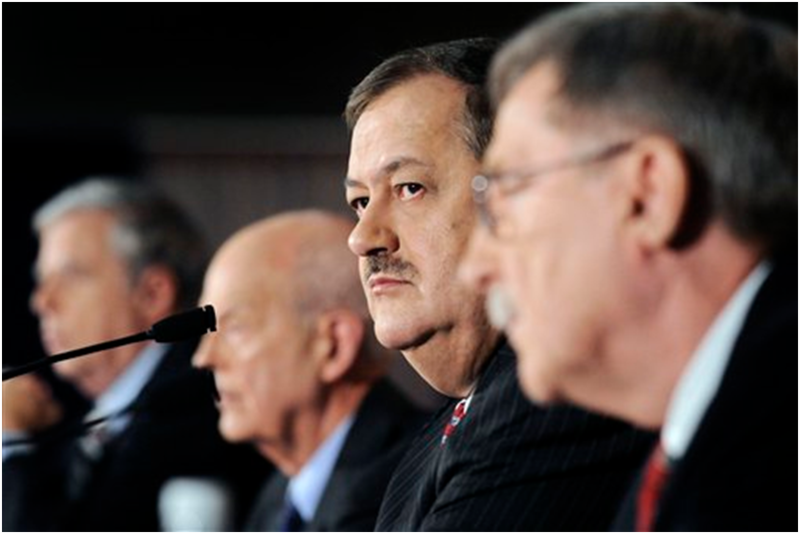 Image: Massey Energy Co. Chairman and CEO, Don Blankenship, second from right, attends a press conference with board directors, from left, Robert Foglesong, Bobby Inman, and Stanley Suboleski, Monday, April 26, 2010, in Charleston, W.Va. Source: Jeff Gentner, Associated Press. However, a number of industry watchdog groups say that the current relatively weak mining safety laws may make it difficult for the Government to prosecute the people who ran Massey. Why? Because under the current federal mine act, safety violations are only categorized as misdemeanors, with the exception of falsification of records. How to prevent it from happening again… Congress explores solutions. Families of this and other mining disasters as well as concerned citizens are asking what can and is being done to prevent this sort of tragedy from occurring again and killing more miners. [W]e want to determine whether these changes [proposed by the MSHA] will produce the safety results we hope to achieve. That is why the testimony from today’s witnesses is so important. Our witnesses have more than 100 years of combined mine safety experience, and their professional expertise and personal knowledge will help inform Congress about the current state of mine safety enforcement, whether MSHA – in their opinion – is on the right track, and what other tools are needed to safeguard the health and well-being of miners. In addition to needing more—and more up-to-date – equipment, MSHA’s enforcement tools should also be modernized. For example, MSHA’s criminal penalties have been so insignificant that they have not served to deter unlawful conduct. In order to allow inspectors to observe actual mining practices, Congress mandated that MSHA’s periodic inspections be conducted on an unannounced, surprise basis. Therefore, it has been against the law for anyone to give advance notice of MSHA inspections. Yet, as we have learned from the Upper Big Branch investigation and the indictment the Assistant US Attorney issued against Hughie Elbert Stover, the head of security for Performance Coal Company, Mr. Stover regularly and continually used signals to give advance notice of MSHA inspections. Miners from Upper Big Branch have also reported that they were directed to and did change their mining practices, making short-term adjustments only when they learned that government inspectors were coming to a section to inspect. How do I learn more about mine safety issues? One of the more interesting and important roles the Government Printing Office has is to transcribe and formally publish the details of Congressional hearings such as these. Reading the testimony from mine safety experts and others in the mining industry gives some fascinating details about and insight into a world few of us get to see: from boardrooms high in office towers to deep underground, where mining operations are either decided or executed. Online: Note: This item cannot be ordered online. Find it on GPO’s FDSys document archive database. Other Related Federal Publications about Mine Safety: Additional official publications about mine safety laws and enforcement actions can be found on our online bookstore. Amended Mine Act, Procedural Rules, and EAJA Rules – This publication contains the updated version of Title I of the Federal Mine Safety and Health Act of 1977 (Mine Act) integrated with the provisions of the Mine Improvement and New Emergency Response Act of 2006 (MINER Act), and the Commission’s procedural and Equal Access to Justice Act rules. Federal Mine Safety and Health Review Commission Decisions is a bimonthly periodical to which you can subscribe on our online bookstore that publishes final decisions and enforcement actions on legal mine safety and health disputes brought to the FMSHRC (Federal Mine Safety and Health Review Commission). About the Author: Michele Bartram is Promotions Manager for GPO’s Publication and Information Sales Division and is responsible for online and offline marketing of the US Government Online Bookstore (Bookstore.gpo.gov) and promoting Federal government content to the public. Several generations back, some of her relatives came from the hard-working, coal-mining country around Huntington and Bartram, West Virginia. This entry was posted on Thursday, December 8th, 2011 at 5:47 pm and is filed under Federal Mine Safety and Health Review Commission, Mine Safety and Health Administration. You can follow any responses to this entry through the RSS 2.0 feed. You can leave a response, or trackback from your own site. Appreciating the time and energy you put into your site and detailed information you provide. It’s awesome to come across a blog every once in a while that isn’t the same out of date rehashed information. Wonderful read! I’ve saved your site and I’m including your RSS feeds to my Google account. It is important to restore the old fashioned family values that were destroyed in the advance of industrialization and post industrialization. Nice job. It’s about time somebody like you told the truth. Way to go. Regulation and education are a great combination in promoting mine safety. Interesting Post, What important problem in the coal mining field did Thomas Newcomen’s storm engine guidance remedy? The atmospheric engine invented by Thomas Newcomen in 1712, today referred to as a Newcomen steam engine (or simply Newcomen engine), was the first practical device to harness the power of steam to produce mechanical work. Newcomen engines were used throughout Britain and Europe, principally to pump water out of mines, starting in the early 18th century. James Watt’s later Watt steam engine was an improved version of the Newcomen engine. I Believe the person who said ” the cost of doing business” hit the nail on the head. What pain can be placed on those responsible that would reflect the pain suffered by those poor miners? I am always illuminated by posts from the GPO. Thank you for your work! The real issue that may mitigate some short term risk is to enforce the regulations already in place. Without adequate enforcement, why would safety regulations be followed ? Fines from regulators would simply be considered a cost of doing business. Hello, I’m in Brazil and this moment is a moment for prevention all threat and mistakes around the world. I’m working in management and the main [focus] is accidents, single or mass ones. We have to create a Group for Preservation of the Humanhood, searching laws to [circumscribe] these occurrence, the terrorism, the presupposition that the bad inspection is normal. The situation of the world require our sentiments in favor of the others.